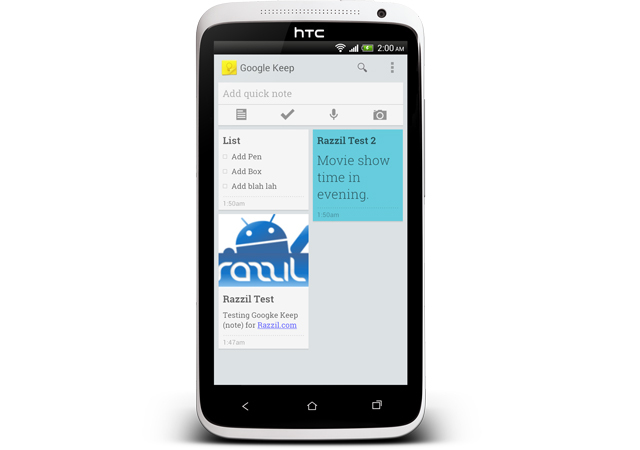 Google has unveiled its new Note-Taking service, Google Keep. Google Keep allow user to quickly take any note as it struck on your mind. Create a checklist, enter a voice note or snap a photo and annotate it. Everything you add is instantly available on all your devices – desktop and mobile. You can access Google keep using url https://drive.google.com/keep/. TIP: Tap on Google Search Voice Button and speak “take note <your thought>” for e.g ‘take note Get cheque from office’. Google Keep requires Android 4.0 and up and it can be downloaded free from below widget. For Android 4.2+, the lock screen widget is also available to quickly access the app.